The Do-it-Yourself Guide to Surviving the Zombie Apocalypse – Book Review | We Zombie! I received an evaluation copy of this book, written by Bud Hanzel and John Olson with illustrations from Mark Stegbauer. This isn’t just another zombie apocalypse survival guide, as the book is full of new and unique ideas and will have you scratching your head and thinking, Oh – I never thought of that! The book is written in a witty and even whimsical manner which is good – the subject material is very serious and scary and without the humor one might get overly anxious about the impending doom of the apocalypse, even though there is still plenty of time to prepare. Believe me, after reading this book, my feelings of becoming a successful survivor have been cranked up to eleven on a scale of one to ten. The book starts off with a short course in zombology, de-bunking myths and explaining things such as ZTA – Zombie Transforming Agent, un-dead life expectancy, climatic effects on zombies, zombie perception and interactions, along with some common sense. The next couple of chapters deal with planning and preparation, supplies, travel and transportation and the ever important gathering of companions and other survivors to build your team. Building your team is very important and the book covers details of over twelve types of people you will NOT want to have on your survival team. Some of these types are perky cheerleaders, aging sixties flower children, emos and goths, celebrities and politicians, and of course, the total slacker. Should you encounter these types of survivors, refer to Appendix E – more on that later. 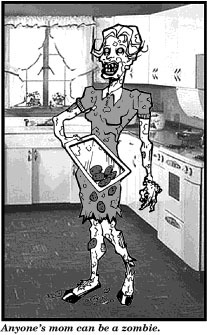 Like any excellent survival guide the book covers weapons and combat, but something that I haven’t seen before – a complete list of do’s and don’ts for surviving the apocalypse in a concise format with illustrations for quick referrals in the time of need. Another unique section of the book deals with the apocalypse time line from day zero to one year out, explaining the progression of the apocalypse, what to expect and how to deal with it. At the end of the book there is a self-test to make sure you’ve paid attention and understand the material in the book – you’re life will depend on it. I’m sorry to say I did miss one question, but after a quick review I got that cleared up. The illustrations in this book are phenomenal, easily the best I’ve seen in any zombie book I’ve read. Stegbauer should be commended for managing to capture the apocalypse in such accurate detail – I would swear he has actually lived through an apocalypse and who knows – he may be a time traveler and has returned to help the human race. Lastly, the book has an exhaustive list of reference material in Appendix D containing resources for learning survival skills such as animal husbandry, anatomy, auto-repair, gunsmithing, gardening, well drilling, etc. My favorite is Appendix C, which is a guide to shovel cooking complete with recipes for pancakes, sandwiches, even stir-fry and desserts, all to be cooked on the blade of your trusty shovel over an open fire. After reading this book, you will never go anywhere without your shovel, and not just for cooking reasons. Oh yeah, Appendix E – this is the appendix that is referred to throughout the book when you run into non-survivor types, or even members of your team who haven’t studied the material, or people that refuse your help or seem to know it all. It’s called Appendix E: The Complete Idiot’s Guide to the Zombie Apocalypse, and I won’t tell you what’s in there because you are smart enough not to need it. 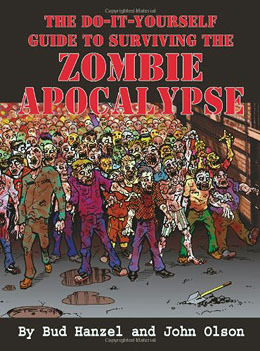 This book is a must-read for anyone who fears or is planning for the inevitable zombie apocalypse, or even for those who aren’t worried and don’t believe in the apocalypse, as the book’s humor will keep you turning the pages and before you know it, you will have become prepared just in case! Iam with you all the way I want zombies to come. Yup…I think I’ve seen that movie one to many times.